Investigators now say they want to talk to the man who bought the SUV on craigslist three weeks ago. Investigators in the Times Square terror case say there is a man who spent time in the Shelton area who they want to interview. Officials believe the man may have used Craigslist to purchase the Nissan Pathfinder used to construct a crude car bomb that failed to detonate at the Crossroads of the World on Saturday evening. Police do not believe he the man in the surveillance video released by the NYPD and now seen around the world -- but it is still too soon to know. The car was apparently sold for cash but investigators say they tracked email, phone and other records to find this lead and to want to question the buyer. Officials stress they still don't know if the buyer of the car is the man who drove the car into Times Square. Investigators say the want to know if this man has views regarding the wars in Iraq and Afghanistan, officials said. Officials do believe the buyer has made calls overseas in recent months but those calls may have been to relatives. Officials are not calling the man a suspect at this time. This morning, police spoke to the seller of the Nissan Pathfinder, but Chief NYPD spokesman Paul Browne said that person is not a suspect. Police have not yet identified who the driver was and Browne said they are still looking for suspects. The car bomb was a rough concoction of ordinary items - fireworks, fuel and fertilizer - that authorities suspect was meant to cause maximum mayhem in the heart of Times Square. In the end, the device fizzled and the city and its residents counted themselves lucky once again: lucky that a vendor saw smoke creeping out of the car parked in one of the busiest streets in America; lucky that authorities responded quickly; and lucky that the would-be terrorists were clumsy enough to assemble a bomb that wasn't capable of exploding. But it was enough to fray nerves and set off a frenzied probe in what the NYPD called the most serious car bomb plot in the city since the first attack on the World Trade Center in 1993, in which six people were killed and more than 1,000 injured. "Clearly it was the intent of whoever did this to cause mayhem, to create casualties," Police Commissioner Raymond Kelly said. Meanwhile the hunt was also on Monday for the middle-aged man who was videotaped shedding his shirt near the sport utility vehicle in Times Square. The man in the surveillance tape, who appears to be thin and in his 40s, is seen removing a dark shirt, stuffing it into some sort of bag and walking away down the sidewalk, carrying the bag and glancing at least twice over his shoulder. The NYPD is asking for the public's help in identifying the man, called a "person of interest." Kelly says there's a lot of work to do as investigators comb through the video of 82 surveillance cameras and ask local businesses for their tapes. Police said they'll be releasing more video from around Times Square, but early this afternoon an NYPD spokesman said that a preliminary review of tourist video from Pennsylvania appears to be of little investigative value and does not appear to match the time of the incident. Materials gathered at the scene is being sent to FBI labs in Quantico, VA for forensic analysis, Kelly said. The gasoline-and-propane bomb could have cut the SUV in half, produced "a significant fireball" and sprayed shrapnel and metal parts with enough force to kill pedestrians and knock out windows on one of America's busiest streets, lined with Broadway theaters and restaurants and full of people out on a Saturday night, Kelly said. The Pakistani Taliban appeared to claim responsibility for the car bomb in three videos that surfaced after the weekend scare, monitoring groups said. Kelly said police have no evidence to support the claims and noted that the same group had falsely taken credit for previous attacks on U.S. soil. Despite the attempt to instill fear, Times Square sprung back to life. "This is America. This is what we do," said Earl Morriss of Seattle, who was sightseeing. "Nobody is going to stop us from living our lives and doing what we want to do." Police released a photograph of the SUV as it crossed an intersection at 6:28 p.m. Saturday. A vendor pointed out the SUV to an officer about two minutes later. The explosive device in the SUV had cheap-looking alarm clocks connected to a 16-ounce can filled with fireworks, which were apparently intended to detonate the gas cans and set the propane afire in a chain reaction, Kelly said. The license plates on the car came from a different vehicle found in a repair shop in Connecticut. Investigators had feared that a final component placed in the cargo area - a metal rifle cabinet packed a fertilizer-like substance and rigged with wires and more fireworks - could have made the device even more devastating. Test results late Sunday showed it was indeed fertilizer, but NYPD bomb experts believe it was not a type volatile enough to explode like the ammonium nitrate grade fertilizer used in previous terror attacks, said police spokesman Paul Browne. The exact amount of fertilizer was unknown. Police estimated the cabinet weighed 200 to 250 pounds when they pulled it from the vehicle. 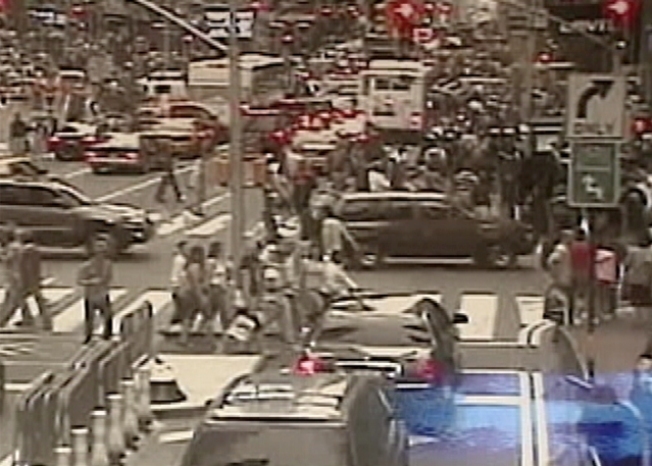 Times Square, choked with taxis and people on one of the first summer-like days of the year, was shut down for 10 hours. Detectives took the stage at the end of some of Broadway shows to announce to theatergoers that they were looking for witnesses in a bombing attempt. "No more New York," said Crysta Salinas. The 28-year-old Houston woman was stuck waiting in a deli until 2 a.m. because part of a Marriott hotel was evacuated because of the bomb.